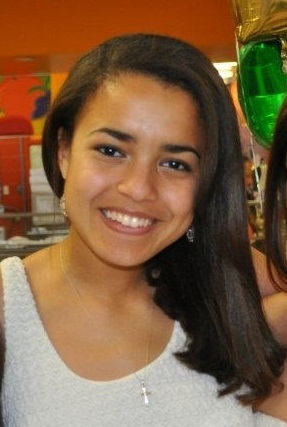 I am a rising junior an International Economics major with a German focus in the College of Arts and Letters. I am a Student Union Board (or SUB) programmer who is in charge of the Movies Committee for campus and have been active in Interhall sports. In addition, I have many interests when it comes to sports, but my favorite is soccer, so I cannot wait to be in Germany during the World Cup! This will be my first time to Germany but not my first time to Europe, and I know that it will be an enriching experience. This grant has provided me with an amazing opportunity to immerse myself in another country and culture as I strive to improve my language and expose myself to varying opportunities that required me to step outside of my comfort zone. As an International Economics major with a German focus. This grant coincides perfectly with my major and academic interests. I have applied to ND International’s Heidelberg program for Spring 2015. So, this shorter experience will prepare me for living and studying at a German institute and university. The added language skills will further enhance my ability to successfully take courses at the university. Also, this grant for summer language study will expose me to the prospect of working abroad. While my future plans are not clear, I know that going to Freiburg is the right step in finding my future career path. I can imagine pursuing a career in international economic development and growth or foreign policy, for example. Also, I am certain that the economic and cultural environment will be a nurturing atmosphere in terms of my academic and cultural growth. This grant has many things to offer those who are willing to take advantage of every opportunity that it provides you with. I personally hope to become more proficient in everyday German conversation and be able to navigate myself confidently in another country. In addition, I am fascinated in different cultures, so I hope to gain first-hand experience during my time in Freiburg. This grant not only allows people to significantly improve their language skills, but it also allows them to leave their comfort zone entirely and gain a more worldly understanding and comprehension. Many people never leave their own bubbles and miss out on the opportunity to understand another culture besides their own. They miss out on the chance to grow and push themselves to their academic and personal limits, and I know that this is what this grant will do for me. 1. At the end of the summer, I will be able to confidently hold an everyday conversation in German with native Germans. 2. At the end of the summer, I will be able to navigate, ask, and give directions in German. 3. At the end of the summer, I will be willing to take risks that are different from my own culture and out of my comfort zone in order to expand my language skills. 4. At the end of the summer, I will be able listen and understand at the rate of a native German speaker. 5. At the end of the summer, I will be able to read and write without having to think it through as much and continuously looking up words. The Goethe-Institut in Freiburg allows students many opportunities to immerse themselves in the community and practice their German inside and outside the Institut through its cultural program. I am particularly interested in hiking in the Black Forest. Additionally, on Sunday nights, the Institut has a group viewing of the popular cult TV series “Tatort” followed by a discussion with German students. While also diving into culture of Germany, as a Catholic, I plan to also attend Freiburger Münster which is only a few minutes away from the Institut for mass which will provide me with an opportunity to witness and interact with other German Catholics. Additionally, I have an interest in Germany’s history, especially war time and post-war German society and history. At the Goethe-Institut in Freiburg, they regularly hold seminars on certain periods of history in Germany, such as the post-war period. These discussions often cover such topics as the social and economic growth of Germany throughout the years. Having the opportunity to attend discussions such as these would not only be beneficial for my major but would also be an opportunity to further my language skills and understanding of German society and history. Tonight is my last night in the United States before I start heading to Freiburg tomorrow morning! I fly into Washington D.C. tomorrow, land in Zurich on Friday, and arrive in Freiburg that same day. Saying that I have a mix of emotions is an understatement as I prepare for this 4 week adventure. As I prepare to leave my family and home, I feel the sadness that comes with leaving those things that make you most comfortable and safe. At the same time, however, I am so excited at the challenge to grow my language and meet and interact with new people in Freiburg and all over the globe. I can’t say that I am not intimidated by the idea of going to a foreign country by myself for the first time whose first language isn’t English, but I know that an opportunity like this will push my language and my comfort zone further than I could ever imagine and make me not only more confident in German but also in my ability to adapt and thrive in any environment. Now, it’s time for me to get some sleep as I prepare for my German adventure! Bis später USA! It is really difficult to even begin to explain or say everything that I have experienced, done, and felt since I arrived in Freiburg, Germany, but I do have to say that when people say the first few days are going to be difficult, they mean it! I made it to Freiburg on May 30th . Getting to Freiburg ended up not being as difficult as I expected to be, however, once I got here and had to navigate my way to my hostel with public transportation and a bit of wandering, I felt somewhat overwhelmed. I know I came here to learn German and immerse myself in the language, but once I actually did it, the shock of and somewhat abrupt transition from being in a recognizable and mostly English speaking environment was a lot to take in on the first few days by myself in another country. After arriving in Freiburg a few days early, I was very anxious to get my studies started, and after a week at the Goethe Institut, I have recognized a significant improvement in my confidence in my speaking and listening. I feel much more relaxed than I ever have before. Additionally, while my listening isn’t perfect, I feel that my comprehension has increased and my response time is not as slow as I felt it was before. For instance, I specifically targeted this skill when I went on my Baden-Baden trip. Our guide, Lula, is a native German and a very very fast speaker. Although my listening had improved, it hadn’t improved so significantly in a week that I could understand German at that speed. However, there was another girl in our group who seemed almost fluent in German and would often have conversations at that high-paced speed with Lula. While waiting for our bus, the two were talking, and I completely focused in on trying to understand what they were talking about at that speed. I am proud to say that I was able to understand some portions of it. They talked about how English speakers should really speak German when in Germany as it is one of the best ways to learn the language and how Sandra Bullock could also speak really good German. I know it’s not a lot to get from a fairly long conversation, but I was just happy to get anything at all from how fast they were talking. In addition, during the week, I had to go pick up money that my dad had wired to a bank in the city. I was able to eventually find the bank and being there gave me a good opportunity to practice my German in a setting outside of the classroom, supermarkets, and restaurants and to learn some new words such as Geldempfang (money transfer). After a few hiccups, I was eventually able to get my money, to have gained a new German experience, and the opportunity to step outside my comfort zone. Over this past week, I have tried so many new things, met so many new people, and am even more focused in trying to learn and continue improving and practicing my German. My second week here has been pretty crazy and busy. On Monday, we had a day off of school due to Pentecost. It was both strange and nice to have a day off for a Catholic feast day and revealed to me a cultural difference between this part of Germany and the United States. On Sunday, a few friends and I went to one of the many beautiful catholic churches in town for mass. During the mass, I found myself able to understand pretty large chunks of what was going on and what the priest was saying during the homily. Also, my knowledge of the mass proceedings helped me to follow along quite well. After mass, I went to a local lake where I witnessed another cultural difference first hand with the Freikörperkultur (aka naked people) in Germany. I had been warned of a much higher frequency of nudist beaches in Europe in comparison with America, but I had forgotten up until then. Thankfully, the lake was split by some trees so there were nudists on one side and semi-clothed people on the other, and I quickly found a spot on the clothed side. In spite of the naked people, the lake was exactly what I needed to help me recuperate and relax after a fairly fast-paced start. On the way back from the lake, a group of us came across a strange show in the park by the guesthouse. Eventually, a German lady approached and started telling us what exactly was happening. Apparently, it is a Brazilian activity called Kampf-Tanzen which is a mixture of dancing and fighting. She went on to tell us of all the different locations of the Kampf-Tanzen studios throughout Germany where we could go and learn it if we were interested. Later in the week, I was able to participate in “Sport am Dienstag” which is a day where many students go to a park near the guesthouse and play soccer, basketball, or volleyball. 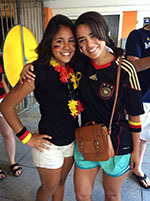 Being a lover of all things soccer and a former player, I took this opportunity not only to bond with more people at the institute but also to have the unique opportunity to combine my German with my soccer. It was a unique challenge and made playing it that much more fun. A few days later, I had the opportunity to wander the city with my roommate. It was truly an adventure as we had no goal or plan in mind except to explore. We ended up stopping at one of the local Konditoreis for Schwarzwälder kirschtorte (Black Forest cake), a local dessert. While it looked really good, it needed some chocolate in my personal opinion. After trying out the local dishes, we found ourselves wandering in the Schwarzwald taking in the absolutely stunning views. This amazing day helped me to realize how lucky I am to be able to study German in this unbelievably beautiful and unique place. I can’t believe that I am already in my third week! My time here seems to be passing way too fast. With the start of my third week in Freiburg, came the first game of the World Cup for Germany against Portugal. Being a personal fan of the German Men’s National team, I was very excited to be in Germany for the World Cup. I always knew Germany was much more interested in soccer than America, but being in this city during the Portugal game and attending the unbelievably massive game watch was more amazing than I could have ever imagined. I think part of me underestimated just how much the Germans love their soccer. According to my teacher there were apparently around 9,000 people in attendance at the game watch held in the city. Some may compare the static and electricity in the air as comparable to a Super Bowl game or a Notre Dame game, but I honestly do not believe that there is anything in America that can possible come close to how much energy and investment that an entire country had put into this one team. The USA has many sports and events that can unite varying cities, and while events like the Olympics and the World Cup may unite America in a way, it just isn’t in the same way that it unites Germany. (But that may also have something to do with the immense size of America in comparison with Germany, but I think I am drifting from the point now). Seeing this city actually explode (but literally…colored smoke actually exploded and it was pretty great ?) over goals is one of the best experiences EVER!!! To avoid spending the entire time talking about how amazing the sports atmosphere was, I will quickly get back onto the rest of this week. On Thursday, we had another Feiertag, Corpus Christi. My roommate and I decided to take this opportunity to go visit a mutual friend of ours in Tübingen. We saw this as an awesome opportunity to see more of Germany and to become more familiar with the interworkings of German transportation. Starting off this story you would think that I would briefly mention the trip and talk more about the time that we spent in Tübingen, but no. This story is not actually about the hour and a half that we spent in Tübingen but about the other 10.5 hours that we spent going and coming back. This trip was an unintentional test of my patience and sanity. The first leg of our trip ran pretty smoothly as we headed towards Tübingen, knowing that we were going to have to make 3 train changes. The problem came when came into Freudenstadt a few minutes late(I know not very German of them right) which led us to miss the next train. Discovering that we had failed to make the connecting train, we went to the schedule to find out when the next train was and found that the next train wasn’t coming until 2 HOURS LATER! Being understandably frustrated, I decided to try and just go with the flow and enjoy this unplanned opportunity to just wander. My roommate and I stopped in the store in the Freudenstadt Hauptbahnhof and got a sandwich and pretzel, respectively. We then decided to wander the city, and I found it to be unbelievably gorgeous. Although we didn’t really walk into the main city center, the architecture and design of the houses throughout the neighborhoods that we walked through was stunning. I ended up enjoying myself more than I expected. The rest of our journey to Tübingen didn’t have any other huge problems, but because we missed the train in Freudenstadt we could only stay for a short while in Tübingen in order to catch the last train back home. I wish I could say that our trip back home was much more relaxing. We had to make 4 changes on the way back, and the punctuality of every train was crucial if we wanted to not be stranded in some random German city (aka Freudenstadt). With my own eyes, I got to witness true German punctuality. As my roommate and I stared down the tracks with apprehension for a hopeful early arrival of almost every train on the way back home, the trains pulled in at the exact time that they said they would and left immediately once everyone had gotten on. If it wasn’t for the punctuality of all of these trains, we would have most likely not been able to make it home. Changing the subject from my rant about the hectic trip to Tübingen ,I recently had a conversation with a few of my peers from different countries in my class, and the discussion was about girls walking alone at night. My other peers from Canada and France thought it was strange and confining that people, especially girls, are often told not to walk at night because it is unsafe. To me and a few of the other Americans in my class this idea was nothing new, but to our other peers this was bizarre and silly. From talking to them about topics from walking alone and gun violence, they say that they think America is too afraid of everything and that we often over exaggerate many things that happen in the US. I found their opinions and perspectives on the subject to be quite fascinating and a bit revealing of American culture from a much larger lens. Overall, it is safe to say that this week has been pretty jam packed with activities, wandering, and discovering new places and ideas. As I write this, I prepare to leave back for the States tomorrow. It is truly unbelievable to me how fast this month has gone and how fast this past week has gone. I came into this program completely terrified and a bit intimidated by the seeming immensity and unfamiliarity of it all, but I am leaving it with a heavy heart as I am truly heartbroken about leaving this unbelievably amazing city and separating from all the friends that I have grown so close to throughout this month. It’s so strange that I won’t see them every day after classes or that I won’t be able to stop by their rooms just to chat. It is just all so truly sad right now, but it has also shown me just how much I have grown throughout this month and just how incredibly lucky I am to have the opportunity to be here and experience a different language, culture, and people. Well now that I have spent enough time moping about how much I am going to miss this place and the people too, I think it’s important that I give a small recap of this last week of an amazing month. So, I had my last Sport am Dienstag this week unfortunately ?. There weren’t as many people as usual for some reason but that meant that we all got to play more than usual ?! I found this this week’s game of soccer to be especially more aggressive than usual (aka I fell down a lot and got hurt a lot because I am a klutz) and much longer than usual. We even had a German come and join us which was pretty cool yet a bit odd all at the same time. I am really going to miss everyone that I got to meet and bond through with soccer. It was truly an amazing and unique combination of my language skills and love of the game. This week my class went on an Ausflug (field trip) to the Schlossberg and Café Schmidt, a local and popular Konditorei in Freiburg. The Schlossberg was absolutely beautiful as it was a location up in the Schwarzwald that gave a view of the entire city. As we enjoyed the picturesque landscape, our teacher told us about all the different locations that we may not have known were a part of Freiburg from a prison (which is apparently much nicer than American prisons and has less people in it as well) to a large soccer stadium for the local team club team to a private landing strip for personal airplanes to the ridiculous amount of Catholic churches that are riddled all throughout Freiburg. It was all very beautiful and interesting, but at that point, I was definitely ready for some Café Schmidt. My stomach had had enough of the view. After scarfing down a delicious croissant, I spent the day wandering the city with my friend just trying to take in as much as possible before I left. Even though I had been in Freiburg for a month, I still found that there was so much that I still had not seen. It was a bitter sweet surprise to still continue to find all these new places because it made me love this city even more, but it also reminded that I wouldn’t be able to enjoy all these new places because I would be leaving soon. I cannot wait to be able to come back and visit when I go abroad in the Spring next year! On a quick and random side note, I just want to say how excited I was to find a small bakery near the Freiburger Münster that sold 1 euro chocolate croissants! 1 EURO!!!! The croissant was the LARGEST one I had ever had, but the only problem with it was that it barely had any chocolate in it, but the fact that it was still 1 euro BLEW MY MIND! Ich liebe Freiburg! Well, I still have to finish my packing as I prepare for an early train to the aiport, so I need to head for bed. Tschüss Freiburg! The month long language and cultural immersion has truly helped my German to improve on all fronts, but it has also allowed me to grow more confident in my language skills. It has definitely been a strange transition back into an English speaking country. I have found myself quite frequently having to consciously think about not speaking Germany in response to my family and to other people because no one will understand what I am saying. If that’s not proof of how effective this month long language program is than I don’t know what is. So, it has been just a week and a day since I have gotten back home from Freiburg, and I have to say that I am already ready to go back. When I first got home, it was very strange not to be surrounded by German or to hear it wherever I go. I already desperately miss the pastries and fresh bread and pretty much all the amazing fresh food that I got to try while I was over there. In one month I managed to fall in love with Freiburg and Germany as a whole, and I cannot wait to go back and be there for even longer for spring semester next year! As my final note to finish this blog of an educational, fantastic, and unbelievable month, I would just like to say…..Schlanddd! In order to continue working on and trying to keep up my German skills as much as possible, I have been trying to practice with a family friend who speaks fluent conversational German. I don’t want to lose everything that I have learned before I even get a chance to utilize it in school for next semester.